It could be hard to turn your back on the fiasco. With no host, an underwhelming slate of films, and the entirety of Hollywood upset over its many planning debacles, the Oscars very well may be a train wreck this year. The Academy of Motion Picture Arts and Sciences should hope so—maybe then people will actually tune in. Viewership for last year’s broadcast hit a record low 26 million, down 19% from the year before and over 50% from 20 years ago, when Titanic won best picture. Gone are the days of the 1990s and early 2000s when the show would routinely surpass 40 million viewers. It has now fallen every year since 2014, sometimes dramatically. The reasons for this TV ratings plummet are numerous: Fewer people are watching live linear television, the format has become stale, and more often than not recent winners have been predictable (the 2017 La La Land snafu notwithstanding). The Oscars show this Sunday night (Feb. 24) is likely to post another record for lowest ratings ever. Perhaps, though, the innumerable controversies that have dominated headlines this month could drum up a morbid curiosity in the evening. How bad is not having a host going to make the ceremony? Can Green Book or Bohemian Rhapsody really win best picture? Are they seriously forcing Lady Gaga to rush through “Shallow” from A Star Is Born in 90 seconds? While this year’s race is relatively unpredictable (Roma is a slight favorite to win best picture, but several other films, including Black Panther, could surprise), the Oscars’ best shot at a ratings rebound is to lean into the shoddiness, embrace the fiasco of it all. Cut off more speeches mid-sentence! Make the entire thing a shameless Marvel’s Avengers crossover promotional event! GiveVice best picture! 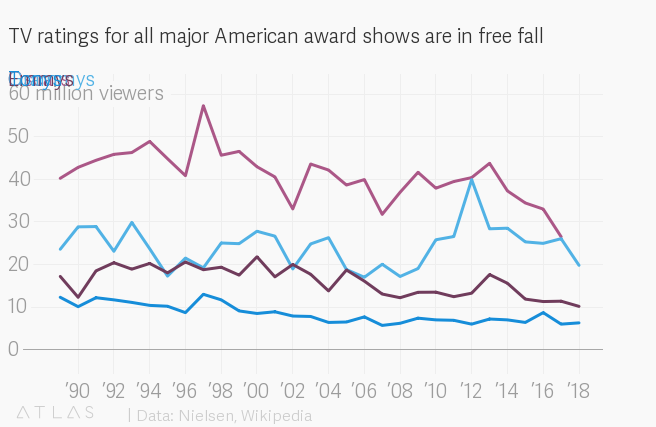 If, come Monday morning, the Oscar TV ratings miraculously recovered from its decades-long nosedive, it’ll probably be because the show was like a car accident you couldn’t look away from. And then the Academy will finally have found the formula to make the Oscars great again: ensure they’re as disastrous as possible.